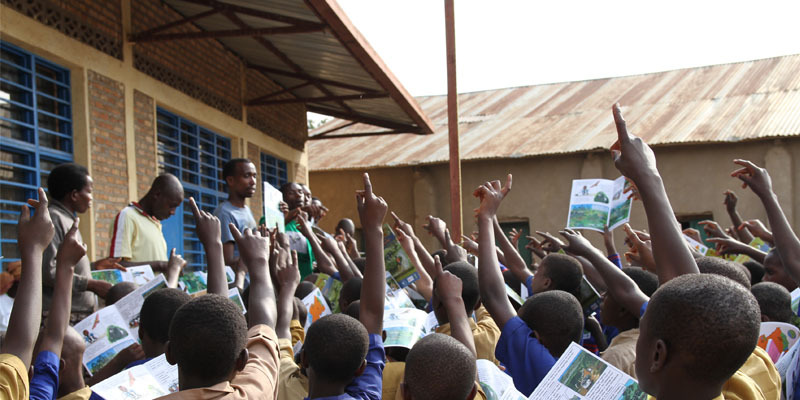 Youth Environmental Education — Rwanda Wildlife Conservation Assoc. Visiting schools nearby key crane habitats throughout Rwanda, we use our fantastic comic book (designed in collaboration with International Crane Foundation) to educate and inspire young people to care for their environment, respect wild animals and help protect the Grey Crowned Cranes and their habitat. One of the key messages of the comic book is teaching children that it is not okay to take crane chicks or eggs. The comic book workshops are loud and lively, and so far, we have reached over 16015 primary school children. They are engaged through competitions, quizzes and prizes and involves a lot of singing and dancing! Our pre and post evaluation questionnaire showed a positive impact on changing the attitudes of students regards taking crane eggs, eating wild animals and keeping wild animals in captivity. There was also a positive increase in the number of students who thought it was important to protect Grey Crowned Cranes and their habitat as well as the importance of wildlife and the environment in general. Working in collaboration with Conservation Heritage Turambe, an educational arts programme has been designed and delivered to 135 school children nearby Rugezi marsh. This programme was adapted from a successful model used by CHT to promote the protection of the endangered Mountain Gorillas. As well as understanding more about the environment and Grey Crowned Cranes, the children learn about health and hygiene. 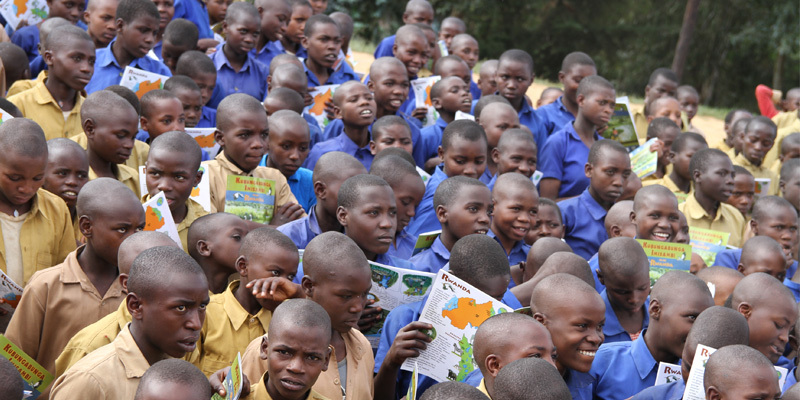 We asked children a number of questions regarding Rwanda’s wildlife and the Grey Crowned Crane before and after giving them a comic book designed by Sally J. Barrett & Darcy Love of the International Crane Foundation. This was a way for us to evaluate the impact of our workshops and the comic book and to see how effectively the conservation messages were understood by the children. Set up in communities close to Rugezi marsh, our 9 youth environmental clubs meet every weekend to discuss and learn about the environment and get involved with activities to protect their local habitat, with a specific focus on the endangered Grey Crowned Cranes. We also take the opportunity to mentor the children to help them achieve well at school. The young people have planted over 450 indigenous trees around the buffer zone of the marsh that will later be used as roost trees for Grey Crowned Cranes. We are grateful for great educational resources from National Geographic and Tusk Trust PACE programme. Workshops with school children nearby key bat sites are planned very soon to educate them on the important role bats play and explain why we need to protect them. We hope to change attitudes towards bats, seeing them as amazing and helpful creatures, not just as scary ones! We will engage young people to help us to monitor bat populations in Rwanda and protect their roost sites.